Prof. Romuald Twardowski from Warsaw (Poland) The head of the Jury. Composer and lecturer born in Vilnius. He studied piano and composition in Julius Juzeliunas’ class at State Academy of Music of Lithuanian SRR in Vilnius. His composing studies he continued in Warsaw Academy of Music in years in Bolesław Woytowicz class. In year 1963 and 1966 he studied Gregorian chant and medieval polyphony in Nadia Boulanger class in Paris. He is a laureate of many prizes and distinctions. His composition “Antifone per tre gruppi d’orchestra” (1961) won 1st prize of Polish Young Composers competition, and in year 1963 he took 2nd place in year 1963 in International Composers meetings of UNESCO in Paris; in year 1966 for his “Sonetti di Petrarca per tenore solo e due cori a cappella” (1965) he received 1st prize at International Composers’ Competition in Prague. In year 1965 and 1973 he received 1st prize in International Composers’ Competition in Monaco. In year 1994 he received the prize of AGEC – West European Federation of Choral Societies and the prize of Polish Composers Association. In year 2006 he won Paderewski Prize. Since 1971 Romuald Twardowski has been the Professor of Warsaw Academy of Music. He is the jury member of many choir competitions and the Artistic Director of prestigious International Festival of Orthodox Church Music “Hajnówka”. He composed numerous brilliant compositions for choirs, orchestras, soloists and musical ensembles. Born in Hondarribia (Basque Country-Spain) in 1949. Graduated in Medicine by the University of Valladolid. Initiated into choral music by Erwin List. Conductor of mixed choir Ederki Korua in Valladolid (1971-1976). Founder-Conductor of mixed choir, Eskifaia Abesbatza in Hondarribia (1978-1994). Founder-Conductor of female choir, Kanta Cantemus Korua (1995 - 2007). Founder-Conductor of female choir, Aqua Lauda Korua (2014) His scores are being published in Basque Country, France, Germany, Japan, USA, United Kingdom and Sweden. Takes part as a jury in composition and interpretation competitions for choirs, in Arezzo, Rimini and Nuoro-Cerdeña (Italy), Antalya (Turkey), Baden (Österreich), Debrecen (Hungary), Ejea de los Caballeros (Spain), Hamar (Norway), Las Palmas de G.C. (Spain), Maasmechelem (Belgium), Maribor (Slovenia), Mérida (Venezuela), Montserrat (Catalunya-Spain), Neerpelt (Belgium), Riga (Latvia), Split (Croatia), Takarazuka (Japan), Tours (France), Tolosa (Basque Country- Spain) and Yeosu (South Korea). Guest Conductor in Argentina, Canada, France, Germany, Italy, Japan, Korea, Norwegian, Spain, Sweden, Taiwan, USA and Venezuela. Invited at IV World Symposium on Choral Music in Sydney, Australia (August 1996). GOLDEN BADGE in his hometown, Hondarribia (1999). ORFEÓN DONOSTIARRA & UNIVERSITY OF THE BASQUE COUNTRY AWARD (2012). Rihards Dubra (Riga, Latvia) Was born on February 28th, 1964 in Riga. He studied music first in Jurmala School of Music, after that at the Emils Darzins College of Music. In 1989, he graduated from the Latvian Music Academy composition class under Adolfs Skulte (as an elective he learned symphonic conducting), and in 1996 earned his master’s degree at the Latvian Academy of Music under Juris Karlsons. During his studies, he began to teach harmony and composition at the Jurmala School of Music. Presently he is a professor Ventspils Music School. His other sphere of work is involved with the organ and liturgy. Rihards Dubra was the organist at the Riga Our Lady of Suffering Church, and, as of 1999, he is the cantor of the Riga St. Mary Magdalene Church. The basic genres of the composer’s creative work are large-scale genres for voices with accompaniment, choir music, organ music and symphonic music. Irrespectively of his genre choice, Dubra’s basic creative interests turn to sacred music. “As the belief is the only purity in this world, I cannot see anything better, only to write sacred music,” the composer comments on his creative activities. The composer’s activities at St. Mary Magdalene congregation in Riga and singing in the group Schola Cantorum Riga from its very beginning give inspiration for his creative work. The basis of Rihards Dubra music style is the unification of minimalism and neo-romantic tunes with the intonation, form and philosophy of Gregorian, Medieval and Renaissance music. “My music often is meditative; I like to stop a moment and to check it for some time. It is not possible in life, but music lets manage the impossible – light, longing and eternity speak to us feeling every moment…” Rihards Dubra’s music has been performed in several countries of the world: Latvia, Lithuania, Estonia, Sweden, Norway, Germany, Poland, England, France, Austria, Italia, Japan, South Africa, Canada, Argentina, USA and others. Ambrož Čopi graduated from the composition class of Dane Škerl and completed his post-graduate studies in the class of Uroš Rojko at the Academy of Music in Ljubljana. 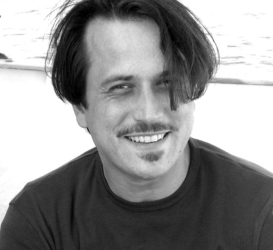 His compositions received awards at numerous composer competitions and are included on CD’s: Lyrical Aquarelles (by the Academic choir APZ Tone Tomšič, conducted by Stojan Kuret) and Birdies were still dreaming (ČarniCe, conductor Stojan Kuret), as well as on various CDs by other national and foreign choirs. His compositions are published by the publishing houses Astrum, DSS, and Sulasol. For his outstanding achievements during his study Ambrož Čopi was awarded the Young Musician Award in 1995, in 1997 he won the Prešeren Prize of the University of Ljubljana. He works as a prof at the Music Gymnasium Koper and Konservatory of Music Ljubljana. He conducts the Youth Mixed Choir of Gymnasium Koper, the Choir KGBL, until 2007 he had conducted the Chamber Orchestra »Vladimir Lovec« (2005–2007). Already at the time of his study he founded the Chamber Choir Iskra Bovec (1992), 1998 he took the conductor’s position in the newly founded Nova Gorica Chamber Choir (Komorni zbor Nova Gorica) till 2004 and in the Mixed Choir Obala Koper (till 2007). Since 2004 he has been the conductor of the Academic Choir of the University of Primorska. The choirs brought him nine gold medals from national competitions, fourteen first places and several gold awards from competitions abroad: the Grand Prix of Varna (Bulgaria, 2008), Tonen 2000 (the Netherlands, 2006), Prèveza (Greece 2003 and 2006), the »Franz Schubert« from Vienna (Austria, 2001), Cantonigròs (Spain, 2000 and 2011), Fortlauredale (the USA, 1999), Samobor (Croatia, 2011), Ohrid (Macedonia, 201and Gdansk (Poland). For his interpretations he was awarded several special prizes; he further received prizes for exceptional achievements with the choir, and was selected the best conductor of the competition. In 2009 he was awarded the Gold Medal of the University of Primorska for the achievements with the APZ UP choir. As a professional adjudicator and a member of the competition juries he is regularly invited to various choral events and competitions, and as a lecturer he is involved in choral music seminars at home and abroad.